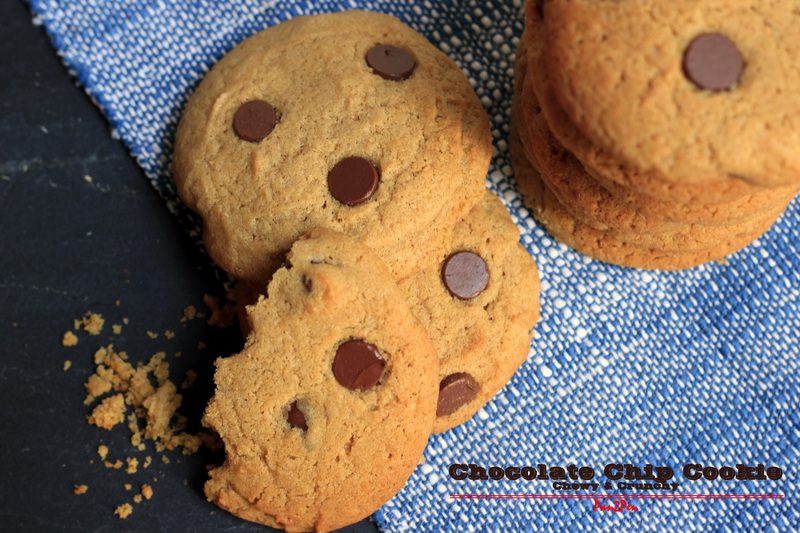 Just like the name says, this recipe makes chewy, still crispy on outside, not too sweet, perfect shaped, not too flaky and not too flat chocolate chip cookies. Yes, I want my chocolate chip cookies certain way and if you are one of them you are looking at the right place. I wasn’t the chocolate chip cookie girl, until a good friend and avid baker Sarah introduced me to one of her delicious homemade cookies. 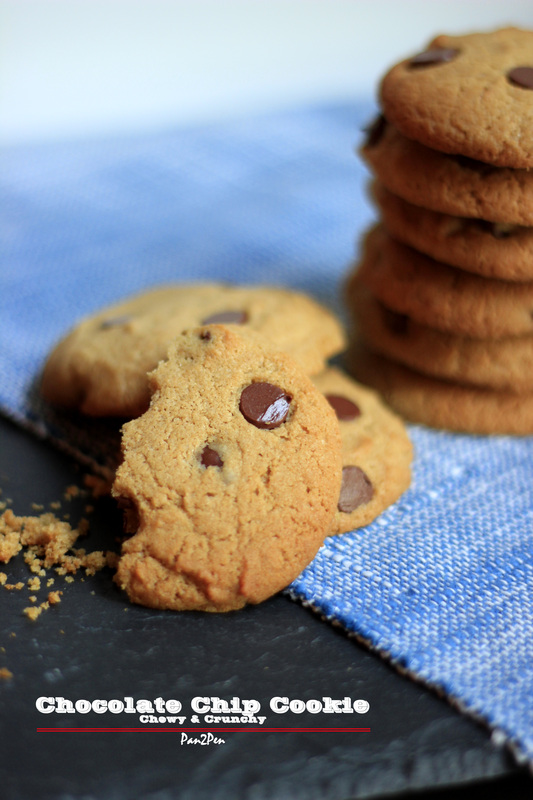 I believe either you like chocolate chip cookie or you don’t and it’s me who likes chocolate chip cookie provided they are homemade and meet above criteria. I have penned recipe named Sarah’s cookie recipe in my recipe book that she had found from king arthur flour website. And ever since I became fan of these cookie and started baking at home. After baking and serving number of batches and tasting along the way, there is one quality I felt missing from these cookies and it is that I wanted my cookie bit more chewy, not soggy or wet in the middle, plain chewy and still crunchy on the edges. Few days ago I came across another chocolate chip cookie recipe from King Arthur flour recipe collection. I gave it a try over the weekend to take along as treat for kids at my daughter’s dance class and the result was amazing. Chewy yet crispy cookie, just how I wanted. In my 5 yr old words; Mom, I like your homemade cookies better because they are fresh which was enough to melt my heart and earn her another cookie. Read smart cookie here. Sharing perfect chocolate chip cookie recipe that worked for me adapted from King Arthur flour’s recipe collection, Joy’s brown butter chocolate chip cookies with pecans. I baked with couple of my own tweaks to suit my quick and easy style of cooking & baking. This is nuts free recipe. I am also working on egg less & gluten free version, will share that soon. With holiday’s season approaching, I desperately feel the need to have couple treats and their trusted recipe handy. This is the first in the book and its here to stay. I tend to look at the ingredients only before starting to bake and I should admit how many times I have realized not having or missing important tools handy while baking going through the direction and finding things. Most important thing before starting to bake anything to have everything ready within arm’s reach. Hence, I feel the need to mention special tools followed by ingredients. Parchment paper (I highly recommend), Small cookie scoop (Guiltless size for kids and grown ups, Ice cream scoop will make really large cookie), Flat baking sheet, Wire rack, Flat spatula, Stand mixer or hand mixer or if you are in mood to work your arm, wire whisk will work too. Shift flour, baking soda and salt and set aside. In the bowl beat butter and brown sugar until combine, for about 3-4 minutes. Now add clarified butter along with granulated sugar and beat until the mixture becomes light and fluffy, again 3-4 minutes. Add one egg & egg yolk at a time, add vanilla extract and coffee powder, beat for another minute. Add flour mixture and mix just until everything is incorporated, avoid over mixing. At last fold chocolate chips with spatula and scoop on the baking sheet leaving about 2 inch space in between each cookie. See the image for reference. If you are making large cookie leave more room to expand. Flatten the top a little. At this point you can add extra chocolate chips on top. Bake for 12-15 minutes or until the edges starts too look brown and the middle looks set. I use convection over and depending upon the type of oven you are using and size of the cookies, baking time may vary by a minute or 2. Keep an eye at the end of the baking. Once cookies are baked, remove the baking sheet from the oven, lift cookies with flat spatula and let them cool on wire rack for 15 minutes. Serve warm, its how I like personally or store them in to air tight container at room temperature for couple of days if there is any left over. 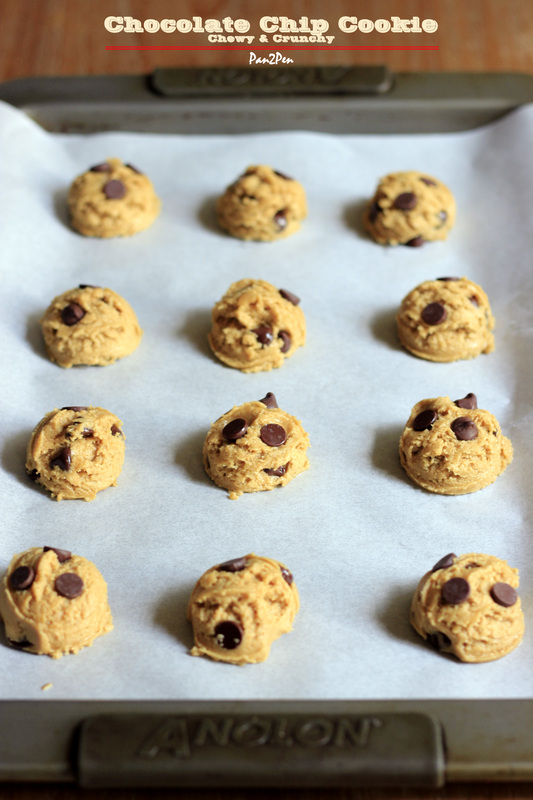 Extra baked cookie stores well in freezer for long time, I prefer to freeze the scooped dough and bake when I need to. Just bring cookie dough out of the freezer while oven is preheating and bake as directed above. If you want more flat shaped cookies, thaw them well before baking. Pack them in to lunch box, serve as after school treat or take along on your next adventure. Suggestion to make holiday favorite, add couple holiday special colored mini M&M on top right before baking. Follow the same idea for your favorite occasion and these cookies will sure impress the guest.